Yesterday, a friend of mine from church called with some “quilt questions”. 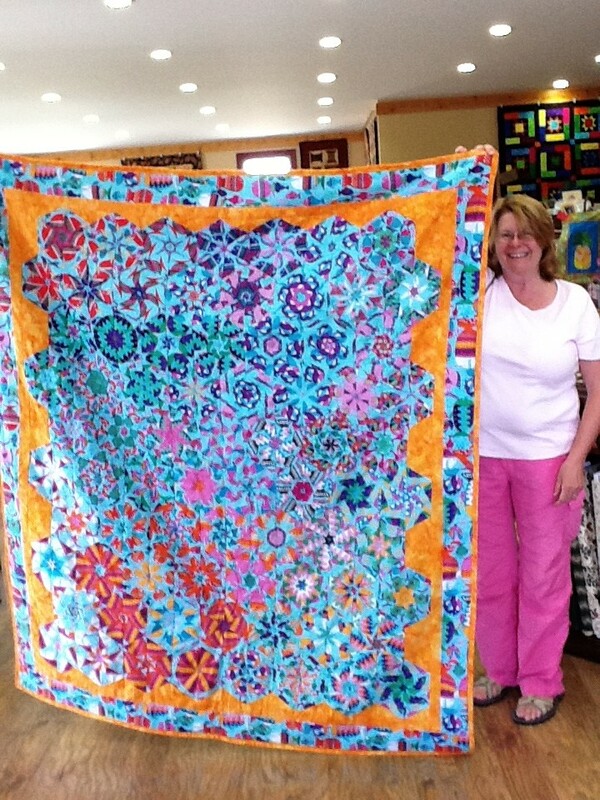 She has worked with me on our Senior Quilt project in the past and is an excellent seamstress. She is getting ready to “bind” her quilt, and wanted to chat before she got started. She had been at the fabric store and looked at the price of the premade double fold binding packets and knew that I could give her a better method. I answered the questions on the phone as much as I could, then offered to share some resources that I have unearthed online. By the time I got finished sharing all of it with her in an email, I felt like I’d just written a blog post. I thought others who read this blog might find it useful too. 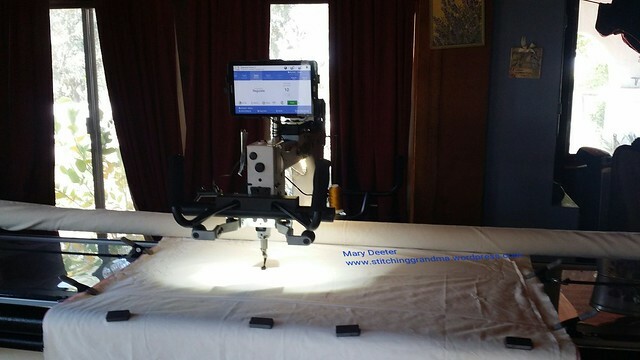 DISCLOSURE — none of these methods are my own, they are all resources I have come across in the 10 years that I have been quilting. 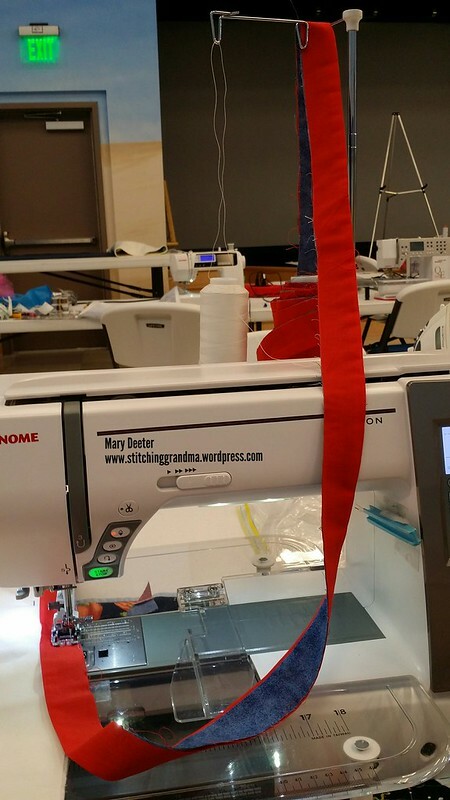 “Susie’s Magic Binding” , also known as “binding with a flange”. My hubby thinks it really adds a “pop” to the quilts. The directions are well written, easy to follow. The video gives great instructions to follow along with the written instructions from her blog. Take note at around 8 minutes into the video of the method that is used for joining the ends and lining up the “flange/piping”. This is the only “tricky thing” about this style of binding, and that is joining the ends and making the flange line up. 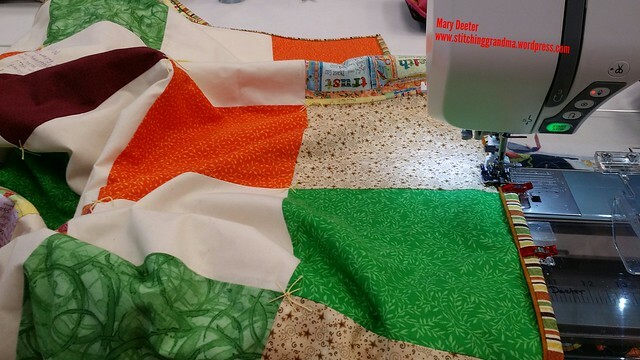 MY TIPS — In any method you use, I find that once you attach the binding to the BACK of the quilt, you get a better result by taking the quilt to the ironing board, and pressing that binding, against the seam, towards the raw edge of the quilt. That way it is sharp and crisp when you roll it to the front. 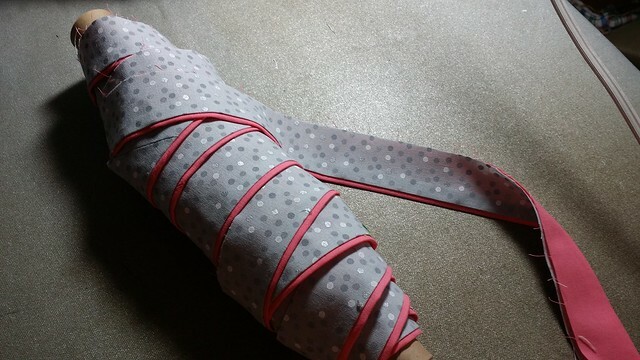 I also take the time to bring it around to the front and PIN or use clips to hold the binding in place, so I have less fiddling around while I sew. 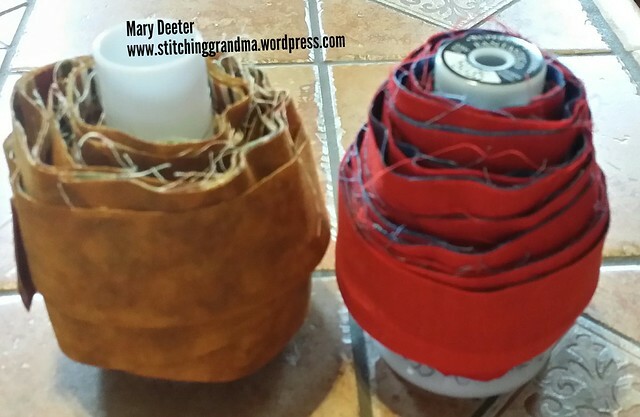 I use my WALKING FOOT when doing binding, because you are going through SO many layers. I also use the TQM ” The Binding Tool” to join my ends, and I often BASTE the join until I have the piping lined up perfectly. I don’t always get my join perfect first try, and I find that basting the join works for me. There are many ways to join the ends of binding and you-tube is a great resource. I have never mastered the “pin trick” in the video above. Near the end of this post I put a link to a video I used when I first got the TQM Binding Tool. That video is from Jenny Doan at Missouri Star Quilt Company. OTHER TYPES OF MACHINE BINDING –All of these videos and links are from EXPERIENCED quilters who are great teachers. There a LOTS more out on youtube, but I am sharing some of my favorites. I haven’t looked for a video done by Pat, but her website may have something if you search around. NOTE – Jenny mentions near the beginning of the video about The Binding Tool” and has a video on HOW to use the binding tool. 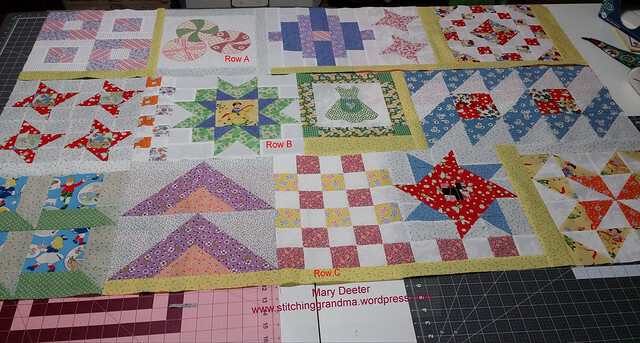 There are LOTS of ways to join your ends, and using The Binding Tool is MY preferred method. 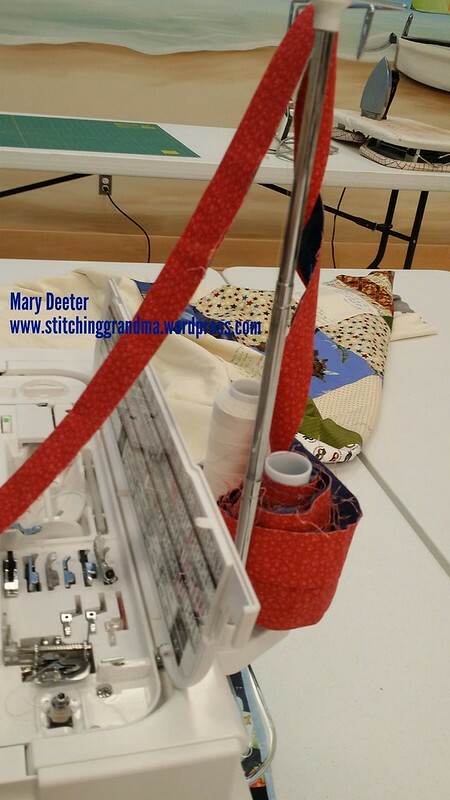 I enjoy making the binding and machine attaching to my quilts. Often times I bring home the quilts from church that our group has made and bind 3-6 of them. I started doing that when my husband said to me once that it wouldn’t be fair to all the kids if the one I bound looked so “cool” and the others had “traditional binding”. I try to pull colors from the quilts so the binding is a feature. Here are a few peaks of what I have made over the years. If you click on the photo’s below you will go to the folders they are in on my FLICKR page and you can zoom in a little. Below is a picture of a project I finished at a retreat this year and it has Susie’s magic binding. The little piping really pops along the edge. Contrast is important when choosing what to use. In this case, I had plenty of that fabric, but made the main fabric “scrappy”. QUICK EDIT FOR 2 more photo’s……because my hubby said you might want to see “MORE” and “CLOSER” etc….. 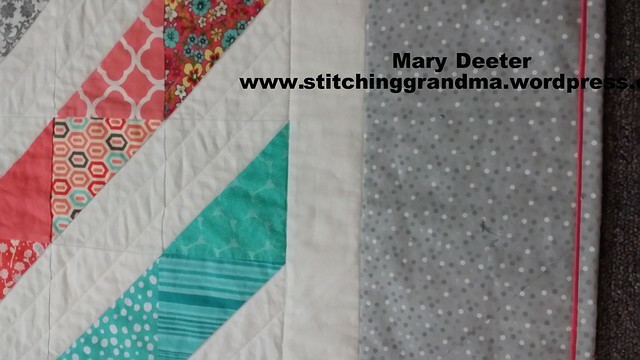 This grey and coral binding is on my youngest granddaughters quilt. It got a 2nd place ribbon at the Ocean Waves Quilt Guild Show in 2017. So, that’s it. I hope you enjoyed this little binding journey! PHOTO INTENSE POST – fair warning….. If you have been hanging around reading over the last 2 months, you are aware that I took a lovely cruise for 10 days in April along Baja California and the Sea of Cortez, also known as the Gulf of California. This cruise returned to the Port of San Pedro California. 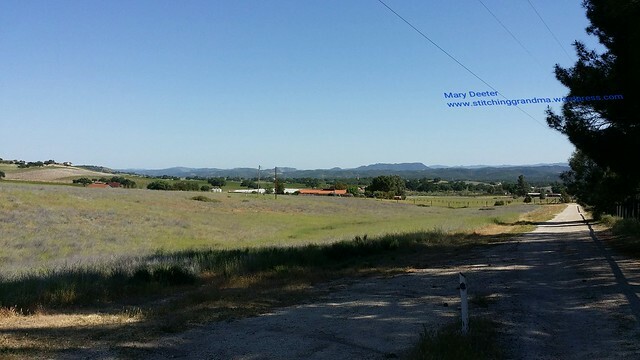 My next adventure began when my brother Rich and his lovely wife, Carolyn (AKA – http://www.OneBlockWonderWoman.wordpress.com) picked me up at the port and transported me (and all my luggage) North of Los Angeles to their lovely home in Monterey County California for a brief stay. There are a few different routes to take but my brother chose I-5 North out of Los Angeles. Boy was I glad he did that! 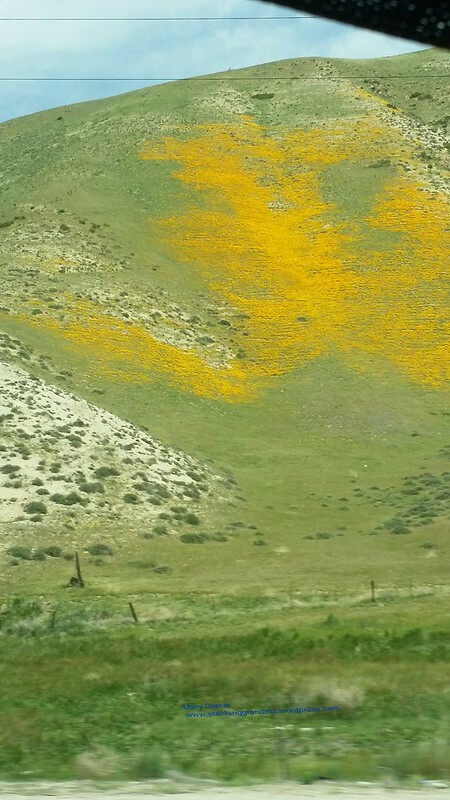 We got to see the hills ablaze with California Poppies. 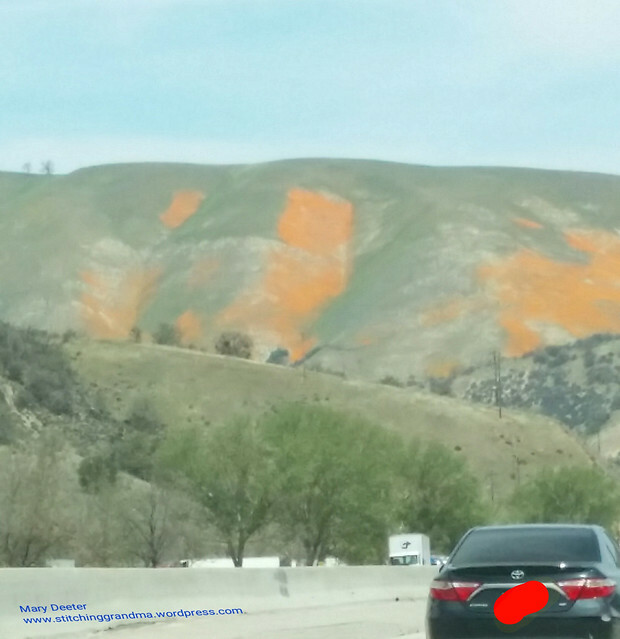 Disclaimer – I grew up in the Los Angeles area, and I vaguely remember seeing the poppies as a child traveling to see my grandmother. Well, did we have a great show on the ride North. Get ready – some of the photo’s appear a little hazy, because we were moving along at 65+ mph, and I was shooting thru the windshield from the back seat or the side window, so I apologize ahead of time. Too pretty not to share! 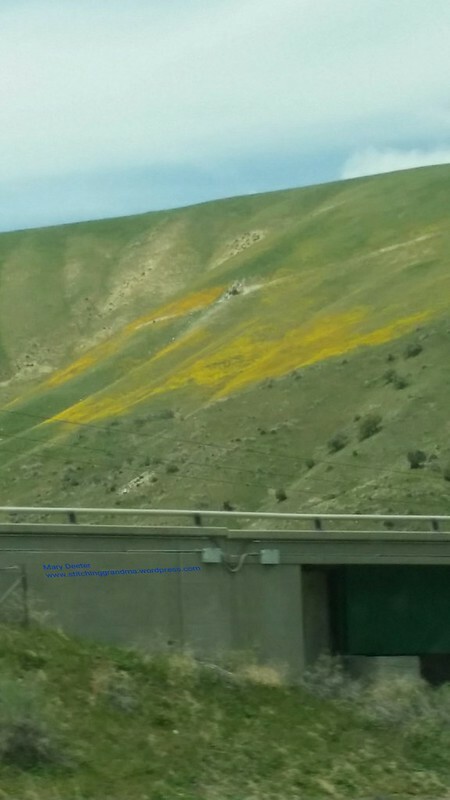 Can you believe the various colors in the hillsides? All that orange and gold and (GULP) GREEN!!! 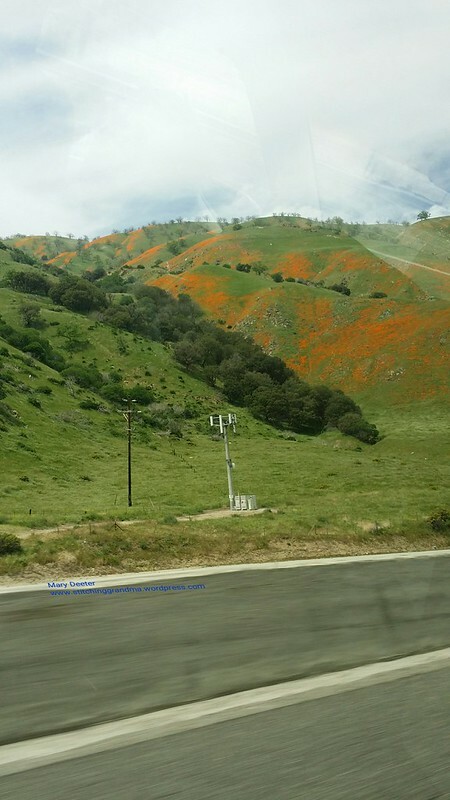 It is not vary often you see the hillsides in California SO green. Spring must have been kind with the rains. 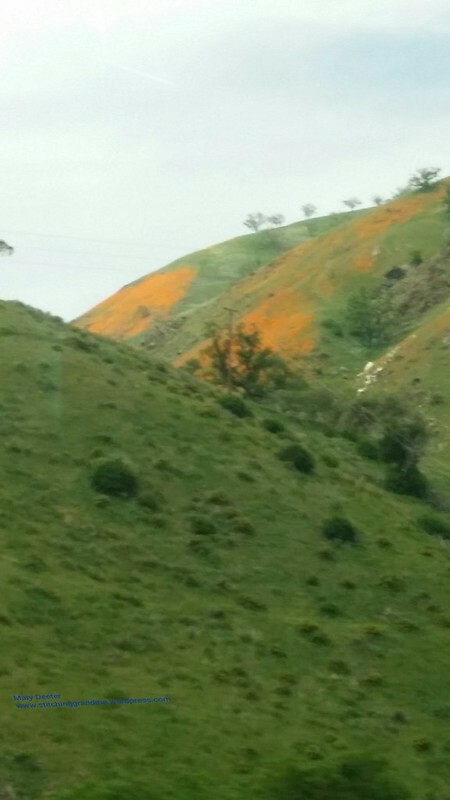 I remember when I lived other places, my mother would go on and on during phone calls about the poppies. I honestly don’t think I have ever seen them until now. I really timed my visit “just right”. 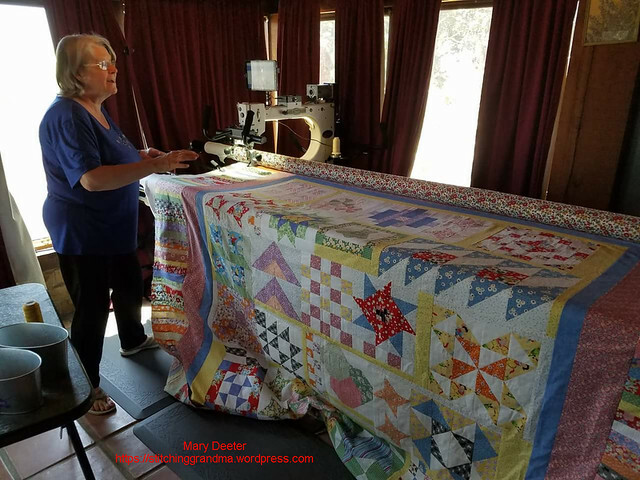 Now, if you are a “travel person” reading my blog, I am about to change lanes and return to my normal activities….and that is QUILTING. I invite you to hang around, you might enjoy the rest of the photos or the story. 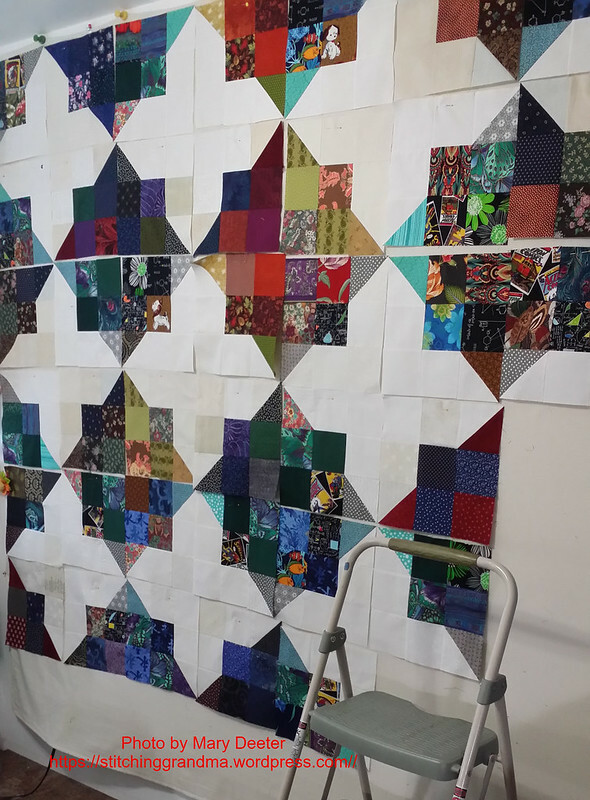 Those regular readers who have followed for any length of time might be aware that earlier in the year, I finished a rather LARGE quilt and planned to visit by brother and his wife and work on quilting it on her long arm quilting machine. This is WHY they picked me up. (Sweet of them to drive 4 hours to get me and 4 hours to take me home! ) California is a very big state! I offered a night in a hotel so they didn’t do all the driving in one day….after all, Rich is my OLDER brother…giggle…..I booked them a room on the Queen Mary in Long Beach. I figured they should enjoy a night “on board a ship” since they were picking me up from a ship. There cabin on the QM was MUCH nicer than a modern cruise ship cabin. ( Oh to go back to the old days on ships!!) If Carolyn (aka oneblockwonderwoman) ever posts her photo’s, I will link to them. Now, back to the story – I packed up my quilt top, and the backing (see the post – In Betweens – for that story) and shipped it to California before my cruise, so it was waiting on my arrival. Dear Carolyn had thoughtfully taken it out of the package and hung both parts to “relax” when she got the package. Since we arrived late Tuesday afternoon, and I was flying home on Sunday, our time together was very short. We got busy and loaded a practice piece to quilt . 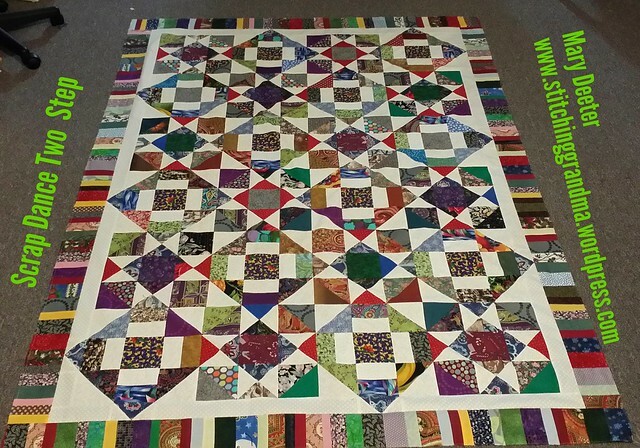 I learned a lot about loading a quilt, and using the leaders and basting the top and sides, and floating the quilt, and how to use the size clamps. 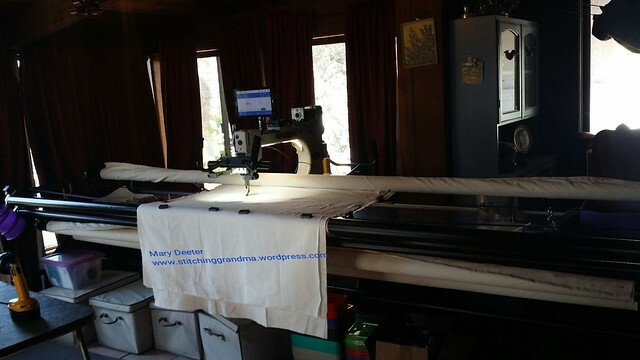 By 10 am the next day we were set up to stitch on Greta, her new Gammill long arm quilting machine. I had LOTS of practice before we loaded my quilt. This is her dining room, with windows on 3 sides. The sun is so bright that she has heavy drapes to block the glare. Greta the Gammill has great LED lights. 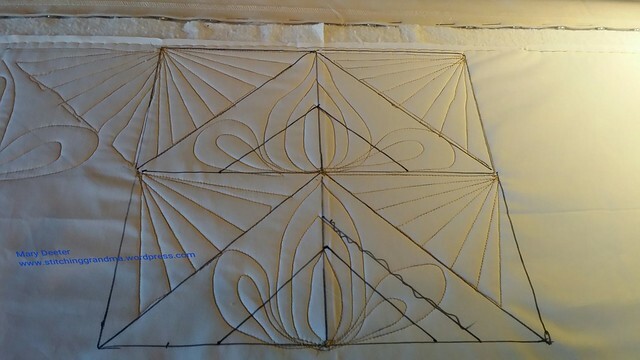 I decided I needed to “draw” a couple of quilt blocks so I could get a better handle on exactly where the needle was stopping and planning out some layouts for various blocks. Since time was short, after 2 practice pieces (and lunch), we loaded my quilt on Greta’s frame. That took us over an hour, getting everything “just right”. This is not a small quilt and nearly fills her frame. I can see why my brother is often referred to as the “Quilters Assistant”. It really seems like a 2 person job getting the quilt, the batting and the backing all set up right. Because I had a pieced backing, I was extremely careful about the placement of the backing on the machine so the quilt top would be centered. Even though we had been working since Wednesday, the machine said we had an actual 6 hours of stitching time, with over 152,000 stitches in the quilting. The “timer” only clocks when the needle is going up & down, not when the machine is on. (Has something to do with time for oil and cleaning if I remember correctly). There is a lot of “in between time” that happens. Advancing the quilt, taking practice stitches along the side, and the distractions of where I was in California. Their home is on several acres with gardens and meadows and the weather was perfect. 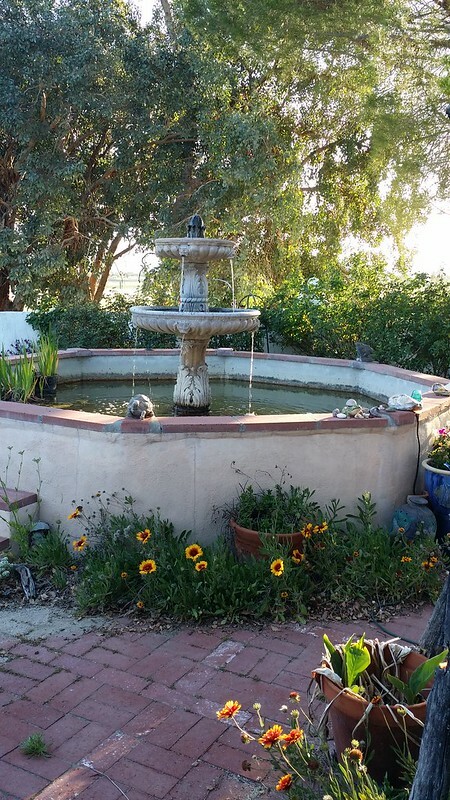 The home was constructed in the manor of a California Adobe, with tiled roof, walled garden area and arches. The view out the windows is amazing. What a great place for a break and a stretch! 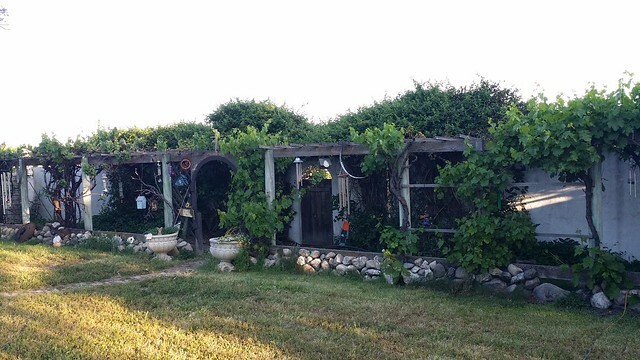 Those of you who follow Carolyn on her blog – https://oneblockwonderwoman.wordpress.com know about what lies in wait on the other side of the gate in the grape arbor, just outside the courtyard wall. And of course, in between times, we had to eat breakfast lunch, dinner, drink wine and go for walks. Check out the great area they live in – quietly nestled in a little valley down a dirt lane. There are vineyards and cattle and farmers all around. It was good to get out, stretch my legs and enjoy the beautiful Central Coastal California. We ran out of time on Saturday when all of a sudden the top tension went nuts when we changed bobbins, and nothing Carolyn adjusted could make the machine sew right. There were big loops on the bottom (thankfully I had an extra 6″ of backing all around and she had a place to test stitch.) 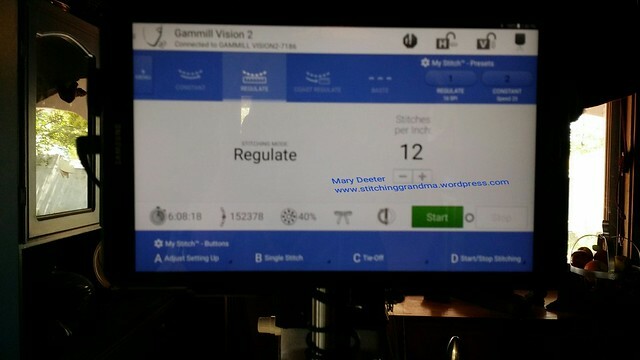 Many phone calls to her dealer tech rep, and to a friend with a Gammill still left us unable to stitch. So, we stopped, left the quilt on the frame and the next day, I had to fly home. 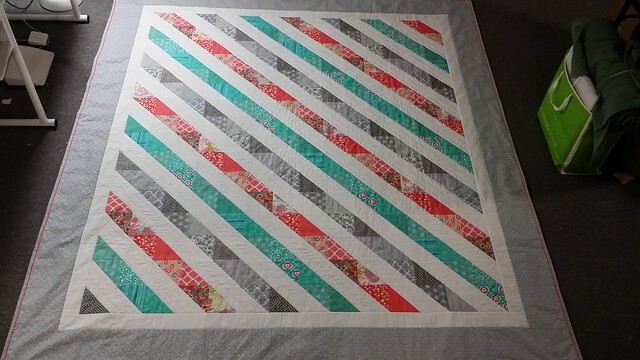 After 2 weeks of “adjustments, and a visit by her friends with a Gammill; she was able to finally get things working again, and she finished up my quilt. Carolyn did the center of one block, and finished the last 2 blocks and quilted the border for me. I was very thankful that she was able to do this and ship it home. She trimmed the quilt for me and saved the cutaway backing pieces. She knew I was planning to use them for the binding. My quilting is a novice attempt, so I will enter in the non-judged category. Overall, I love the outcome, and I declare the project FINISHED!!! 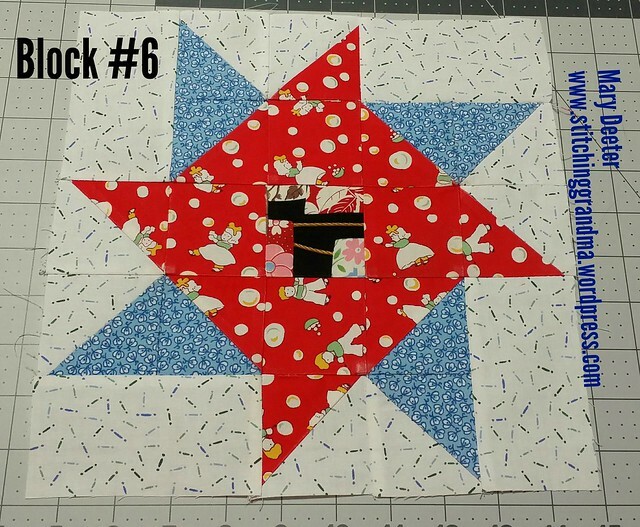 Note – Pattern is by Pat Sloan, block of the week quilt along (Jun-Dec 2017). Hope you enjoy the pictures included in this post and take time to check out the link to the FLICKR photo album. Have you had any fun travel or quilting adventures lately? My border is SECURELY attached to Grandma’s Kitchen that is! While we were getting buckets of rain, I sat in the kitchen and removed the papers from the back of the pieces I showed in my post yesterday ( Building Borders and Collaborating on Quilts ). They came off very easily because I had shortened the stitch length down from 2.0 to 1.5. My daffodils are very sad, and it looks like I will be power washing and painting that fence this year! 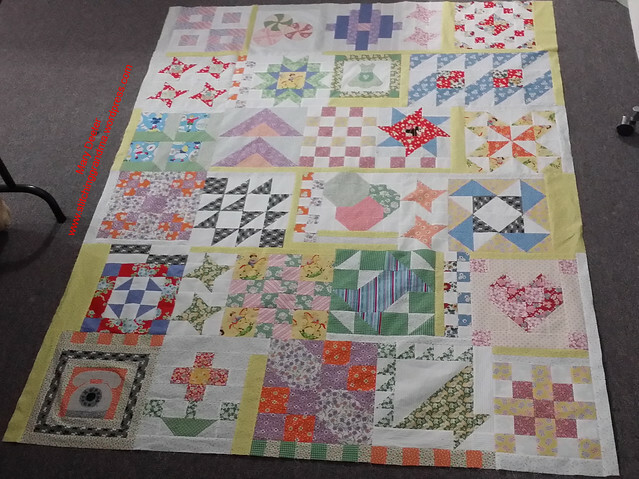 Grandma’s Kitchen border is on, and this quilt is now massive! 91″ wide x 110″ long. So long, that it won’t fit on the design wall or in one photo…..
Time to think about how to solve the backing issue. You might remember I got excited and ordered the backing BEFORE I decided on just how much drop I needed and what my final border was going to be, so I only ordered 3 yards of wide backing. I did pre-wash it to, and have still got to press it with some starch and re-measure. LESSON IN LIFE — wait until the last border is on BEFORE ordering the backing fabric! Now I have to piece it anyway! 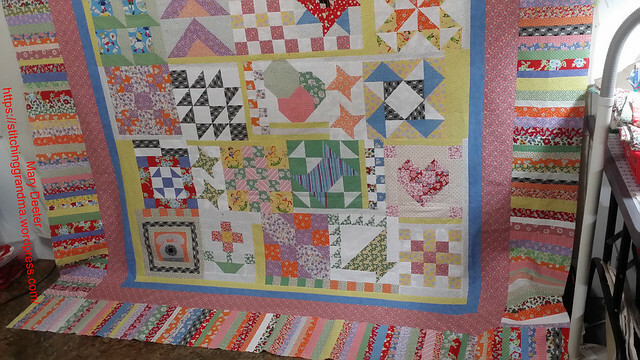 Of course, per the norm….my quilts tend to “hang around” waiting to be quilted, so this one won’t be any different. How did you spend your day? Do you leave quilt tops “hanging around” too? I am building QUILT borders! No politics here folks…sorry~~! !~~ If you came to read about a border between our country and another, you came to the WRONG place. I have spent the last couple of afternoons working on border pieces for my Grandma’s Kitchen quilt. 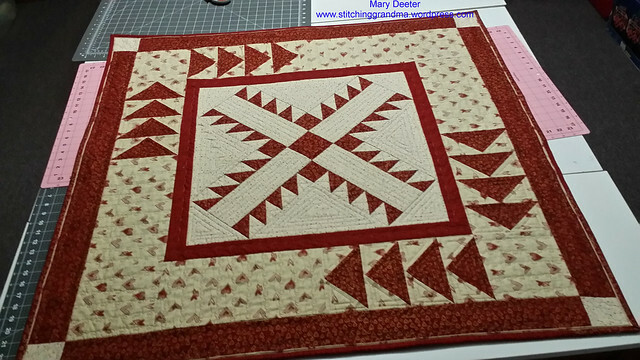 I decided to use a pieced “string” border after I saw a couple on Pat Sloan’s Facebook group Quilt Along with Pat Sloan several months ago. 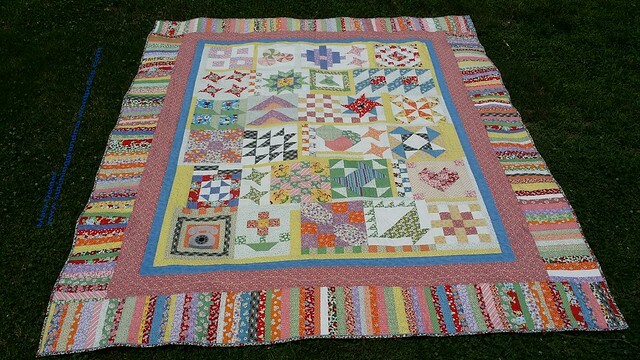 I am a confirmed scrappy quilter, and I have LOTS of leftover fabric from this project. 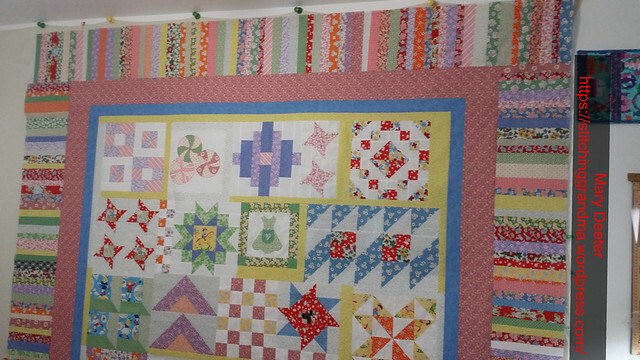 I planned out how much wider I needed the quilt to be and cut my “foundation pieces” (aka phone book pages). I also did a little “quilt math” to figure out just how “many” of those phone book pages I would need. 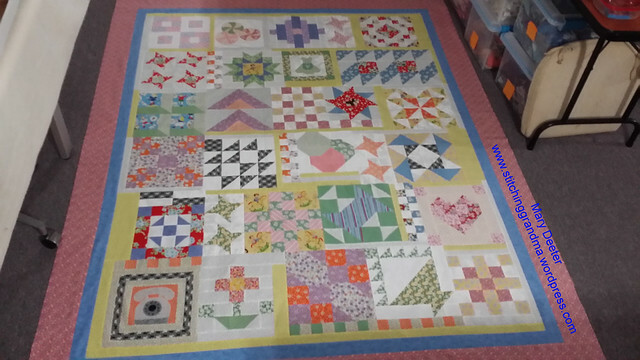 The quilt is currently 73 1/2 wide x 92 1/2 long with the 2 borders that are currently on it. You probably remember this photo if you have been following for at least the last 3 months. 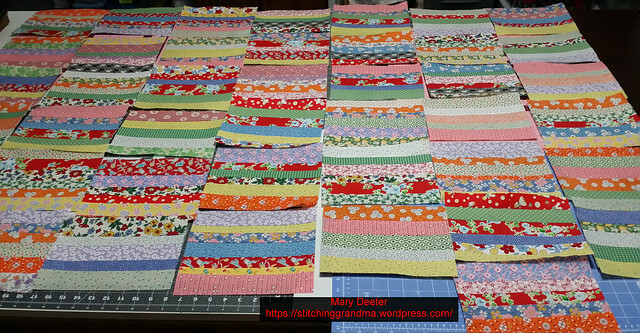 Back to sewing…..So far, I have about 50 units done, and I can’t wait to brave the current “nor-Easter – Toby” and get out to my sewing room over the garage this afternoon! One lesson I have learned about working with scrappy borders is they need to be “stay stitched” on the outer edge. I will have to check the Scrap Dance Two Step before I put it in the mail to One Block Woman. We have also gotten together here in Delaware when she taught me how to do a One Block Wonder (of course) back in 2012. Mine is below . 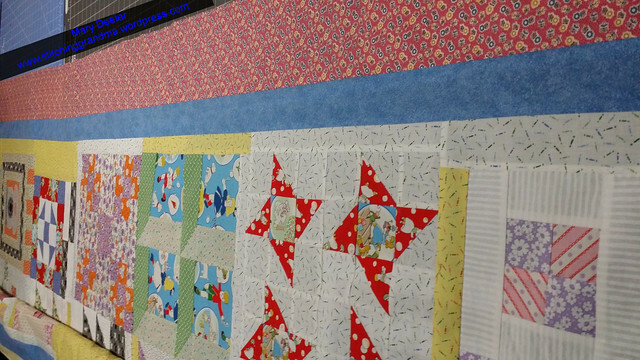 And then there was the first quilt show/classes I ever went to…at IQF Houston in 2013. Gosh that was FUN!! It really opened my eyes to the world of quilting. Do you collaborate with a family member on your quilt projects??? I enjoy our conversations, cross – country! 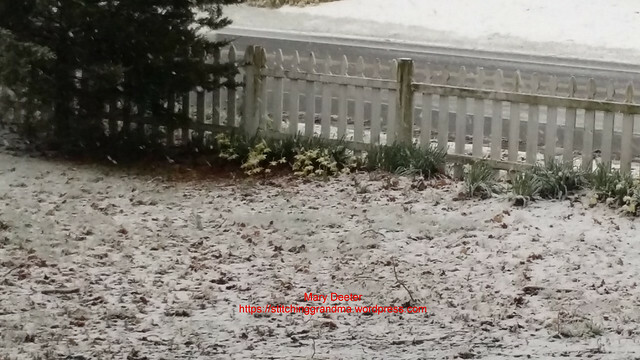 Are you in the path of the current Nor-Easter – Toby? We will either get 1″ of snow or a foot…depending on which way it tracks. We are waiting to find out if our bus trip to the AQS show in Lancaster PA is on or off for tomorrow. Fingers crossed! BUMMER – Bus trip is cancelled. The bus company has cancelled all it’s trips for Wednesday. We better get a foot of snow!!!!!! Every year, since I have been a member of Ocean Waves Quilt Guild, there has been a retreat in early February. I’ve attended many of these retreats and always enjoy the time spent with so many creative, talented people. 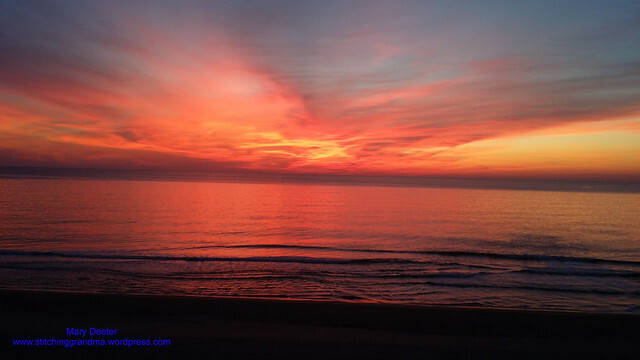 As in the past, we meet at a lovely beach front hotel in Ocean City Maryland, where we are greeted most mornings with spectacular sunrises in our ocean front rooms. 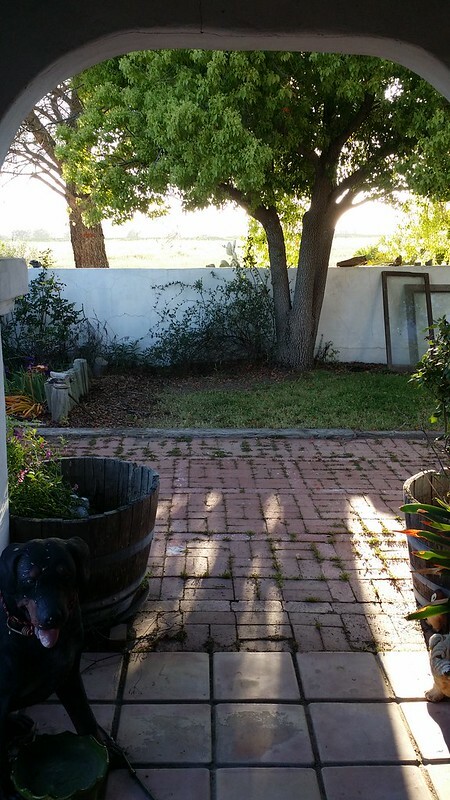 It is inspiring to wake up early at this retreat, so you don’t miss the glorious sunrise. Breakfast is at 7:30, and we are sewing by 9 am ! I did most of the quilting using my walking foot. The exception is in the wide border of hearts, I used a stitch that is connected hearts, and in the narrow red border I did the same stitch. On the outer red heart border I did some wavy stitching. I like to use these built in to the machine stitches if possible. They make quilting a lot easier. If you want to see close-ups of the various quilting that I did, look at the photo’s here – UFO Finish . (There is also a photo of the back where the techniques I used really show). 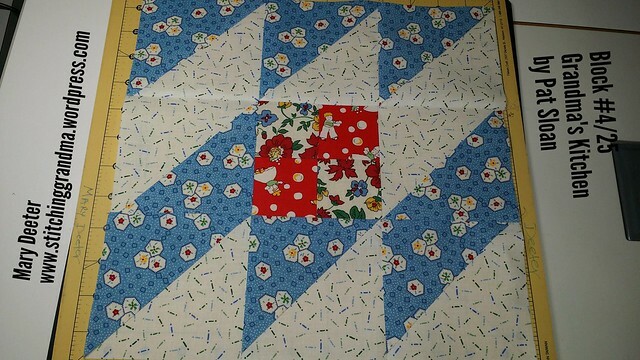 I used the same fabric that is in the area around the flying geese in the flange for the binding. I love that little pop of color along the edge. I added a hanging sleeve while I was doing the binding, and the last thing that needs to be finished is to hand stitch the bottom and ends of the hanging sleeve and make a label! Since this was the “big deal” for me at the retreat, I will stop here and ask – what is the OLDEST UFO you have sitting around, and WHY didn’t you finish what you started? More about the retreat in the next post! Grandma’s Kitchen – Some assembly completed! Some decisions still to make! With the current borders, the top currently measures 73 1/2″ wide x 92 1/2″ long. I am contemplating one more round of borders so I can use it on my queen size guest bed. I think I will bring it in from the sewing room today and lay it out on that bed and take a look and see what kind of drop I want. I think I need to add 10 1/2 inches for a queen on the width. 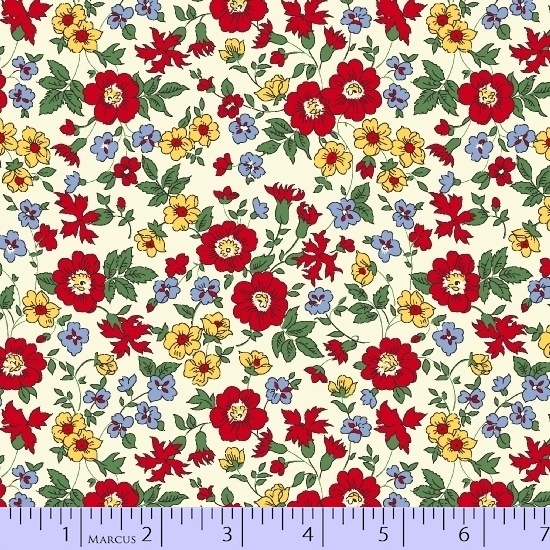 There are several companies doing 30’s fabrics now, and I lost track of all the names. 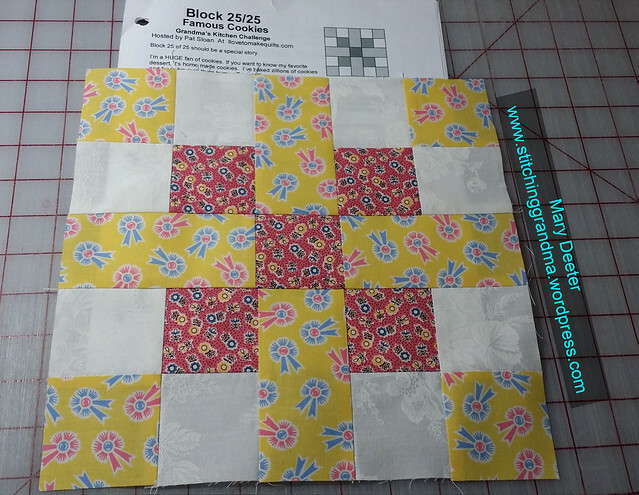 I used Spring Fling for PB Textiles by Terry Atkinson & Liz Lois, for the white and yellow print that is in many of the “filler pieces, and in some of the blocks (like block 4 below). I liked it because they coordinated nicely. Some of the whites, like the stripe tone on tone are “just scraps” from my stash. The medium blue 2.5″ border is VIP by Cranston (2011). It is a nice blender and I had just 1/2 yard in my blue box of stash. There are several tones of blue in various blocks and it was the best choice with the pink border. Yesterday, I ordered the backing fabric and it appears to be “on the way”. I went in search of 30’s reproduction in a wide backing. 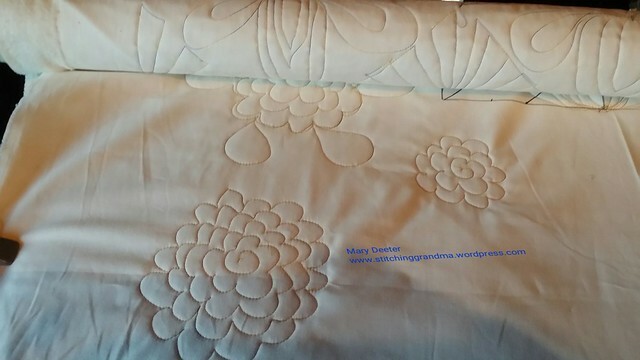 Marcus Fabrics had one print that I already included in the quilt manufactured in 108″ width. Way back in block 4 I used the white background multi floral in the 4 patch center of the block. In the pattern, this block was partially repeated, and I had enough to use again in another 4 patch, and in some of the filler blocks. I was pleased to find a fabric that would really work with the quilt! or search back thru the blog posts using the Grandma’s Kitchen tag as a search criteria. Pat is doing a “quilting” series for this pattern, so now, I need to go study!